“PSALMODY, A REPLY TO M. N. R.
“With a sincere tone and with a cordial respect for all who love our Saviour,” and “with no intention of stirring up heated or angry debate,” permit me to criticize with all kindness the article on Psalmody in the Presbyterian of Nov. 8. The article, doubtless, was intended for the Psalm-singing denominations in this country. Permit me to suggest that their position and belief should be stated with a little more fairness. 1. They repel the implied stigma that they sing Rouse. For, though this version is mainly due to his labors, it must be remembered that, as it came from his hands, it was subjected to the most careful scrutiny, first in England by the Westminster Assembly of Divines in 1645. They made amendments. “After all pains in England had been bestowed upon the Psalms, they were sent down to Scotland in portions for further consideration.” The Church of Scotland divided the work into four parts and appointed a committee of revision for each part. It was amended and corrected with the utmost care, and use made of the various versions then in existence. Then it was sent to all the Presbyteries, and their observations transmitted to the original committee. Then a commission of the Assembly revised the whole. Then it was sent to the Synods and through them to the Presbyteries. Then it was remitted to the General Assembly, and thus carefully prepared and corrected, it was in 1649 “allowed by the authority of the General Assembly of the Kirk of Scotland, and appointed to be sung in congregations and families.” We have better warrant for calling the Shorter Catechism by the names of the committee by whose labors it was composed, or the Heidelberg Catechism by the names of the two theologians who wrote it, or the Presbyterian Hymnal, Dr. Herrick Johnson’s Hymnal, than the Scotch version Rouse’s. 2. Why may they not be permitted to speak of an inspired Psalmody? What abuse of language is it? We call our English version of the Bible the Word of God. We refer to it as inspired. Is that an abuse of language? When our Lord and His apostles and the writers of the New Testament quoted their translation of the Hebrew Bible as the Word of God, no one regards them as guilty of the “folly of claiming inspiration for the Greek version; and so, if “M. N. R.” wished to avoid “heated or angry debate” he should have omitted the sentence, “It is folly to claim inspiration for Rouse.” He will search in vain among the published discussions of this topic for any such claim. All that is meant by an inspired Psalmody in English is a faithful translation of the inspired Psalms as opposed to a mere imitation or loose paraphrase, or such a perversion as Dr. Watts gives of the one hundred and ninth Psalm. But what is the position of these Psalm-singing churches? It is this. The second commandment requireth the receiving, observing, and keeping pure and entire all such religious worship and ordinances as God hath appointed in his word; and forbiddeth the worshipping of God by images or any other way not appointed in His word. Here we stand with them. This is our point of agreement. Now the question comes under this general principle, concerning which we are agreed; have we sufficient authority to use for singing in public worship any thing outside the one hundred and fifty Psalms? Then the main contest is in regard to the meaning of the words, “Psalms, Hymns, and Spiritual Songs” in Ephesians v. 19, and Colossians iii. 16. Did the apostle in these words refer exclusively to the Psalms of David, or did he include under the terms Hymns and Spiritual songs something similar to our modern Hymns? Of course, each one will interpret according to his own practice. But let us not imagine the texts are strongly and positively on our own side. Certain facts should make us cautious. In the Septuagint, which was the translation of the Old Testament in use in the apostle Paul’s clay, the title of the sixty-seventh Psalm was a hymn, psalm, or song. A number have the title psalm or song, and in general the word Neginoth, which the translators of our English Bible merely transferred, is, translated hymns in the Greek. The word hymn occurs in Matthew xxvi. 30, “And when they had sung a hymn they went out to the Mount of Olives.” Most authorities are agreed that the Psalms alone were sung by our Lord and His apostles on this occasion. 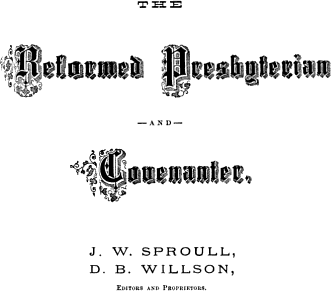 From Volume XVIII, 1880 of the Reformed Presbyterian and Covenanter Magazine found here. This entry was posted in Historical Articles and tagged 1880, debate, Exclusive Psalmody, historical articles, history, response. Bookmark the permalink.